Earlier this summer, I was perusing the web, looking for a professional development opportunity focused on educational technology and teaching in a flipped classroom. September being just around the corner, I was eager to see what other teachers were sharing and reflecting upon. One evening, I happened on a blog post where a teacher discussed how excited she was to attend a Google Applications for Education (GAFE) Conference. These conferences, I was to learn, are held world wide and are tremendous professional development opportunities for educators to share their experiences, network, and acquire new skills working with technology in the classroom. I signed up for the October 25th/26th Kamloops Conference, enthused by the glowing testimonials from the blog and from teachers commenting the conference was perhaps the best they’d attended in a very long while. The days of summer went quickly, and October arrived before I knew it. Driving to the conference, I was excited by the itinerary I’d booked online the night before. There were so many sessions to choose from. First there was a keynote - Transformational Teaching and Learning with Technology. Then, there was Critical Thinking and the Web, Blended Learning Ecosystems, using Forms to Create a Choose Your Own Adventure Web-quest, and finally the Demo Slam, an opportunity for presenters to showcase unique technologies for learning. As the keynote began, there was a keen sense of anticipation, and the presenter, Ken Shelton, delivered a riveting discussion on the purpose of technology for learning. Never before has there been more opportunity to create understanding in a social context as exists today. Never before has the world been so connected with resources for learning, from Twitter to Facebook, YouTube, to online media. At the speed of the electron, the opportunity for human interaction and sharing is only a click away. Education, itself, stands at the precipice of the most networked opportunity in history. As I said, the keynote didn’t disappoint. It lead into sessions throughout the weekend that detailed the opportunities illustrated. In my first session with Tanya Averith, I was impressed by the emphasis paid to creating empowered, knowledgeable digital citizens. Working alongside students, teachers need to impress and model how to critically evaluate information for authenticity and bias. Searching for information is quite insufficient next to knowing and evaluating its veracity. Tanya expertlyshowed numerous techniques for vetting soft information(online information), websites, and demonstrated power tips for more effective searching. “A Google Certified Teacher and Apple Distinguished Educator from Montreal, Canada”, Tanya teaches Educational Technology and Digital Citizenship as a Lead Teacher for the Lester B. Pearson School Board. I was amazed by her zeal, knowledge, and forthright enthusiasm for the challenges and opportunities that lie ahead with educational technology. In my second session, I had the opportunity to learn with Michael Wacker. A former elementary teacher, Michael served as an Online and Adult Learning Specialist and helped spearhead the implementation of Google Apps for Education in his district. Posting a simple website address at the start of our session, Michael challenged a room of forty educators to simultaneously edit a single Google word processing document and collaborate in real time on how teachers were using educational technology to provide a blended learning opportunity. The highlight of the session was the collaborative document teachers created together in a few short minutes. Rounding out my first day, I attended Michelle Armstrong’s session using Google Forms to create a Choose Your Own Adventure quest. Using a series of yes and no decisions, Google forms is an incredible way to tell stories in the genre of Choose Your Own Adventure. With a bit of coaching that highlighted examples of how to create forms, Michelle set a group of thirty educators to work creating their adventures. With my head swimming with information and incredible possibilities from a full day of conferencing, I set to creating my quest. Here it is for your enjoyment - brief, but true to the genre. It was incredibly fun to create, and I was almost taken aback with the ease in its creation and ability to share. Spent, I returned to my hotel amazed by the educational possibilities, philosophies of digital citizenship, and opportunities to share and collaborate using readily available Google applications. Google, it turns out, is much more than a company focused on search. There is an educational tenet of collaboration and exploring evident in the tools provided and presentation of their use in unique, social, and fascinating pedagogical ways. Day two, I awoke two hours earlier than normal, eagerly anticipating my second day. Spending much of my time with Tanya Averith, we explored digital portfolios and the amazing continuum of student achievement cataloged and brought to life by students from their elementary years to graduation. One key quote had a hauntingly prophetic ring. “If you Google yourself online,” Tanya said, “what result will you see? Students are putting so much information online, isn’t it better to be a knowledgeable guide, helping them create a positive digital identity than forgoing this responsibility?” I was struck the importance of these sentiments. A digital reputation is simply a fact in a modern world, connected by social media and the World Wide Web. Working with students to create a positive digital persona that reflects their accomplishments and values suddenly struck me as a key responsibility we as educators hadn’t adequately considered. ! For much of the afternoon on the second day, I attended seminars examining how to bridge the digital divide and provide students with online software and technology for learning. While each presenter demonstrated technologies - Google Drive, word processing, slideshows, and forms, I was struck by the diversity of machinery at the conference. Many presenters used MacBooks. Kamloops teachers and technicians attending used Chromebooks, a new low-cost Linux-based laptop running the Chrome web browser as the chief environment for applications, and web programs. There was a myriad of devices, Apple, Google, Windows, etc. but each running Chrome was able to access documents, share interactions, and load cloud applications. I learned Chrome extensions provided additional software abilities and functionality to meet virtually any software need, from creating podcasts to editing digital video and publishing it online to YouTube, Vimeo, etc. The Kamloops School District has in fact, moved to adopting Google Apps for Education and has invested in low-cost Chromebook (laptop) and Chromebox (mini-Desktop) technology in a manner that provides incredible indemnified tech support from Google, Cloud storage, applications for learning, and more. Considering that average desktop technologies running Windows average $700-$1000, the cost savings alone from highly secured Chromebooks ($270-$400) was impressive. Considering the advantage of Google Applications, secure cloud storage, and an expansive list of web programs to install in Chrome, the value for students and educators was readily apparent. The Roadmap for Successful Implementation of Chromebooks was informative on so many levels. I left hoping to communicate these incredible advantages to my own district. Providing teachers and ideally, students, with a portable cloud- based, secure, indemnified device with so much free software creates an opportunity for learners to work from home, creating new materials to share and promote learning in a 21st Century, Web 2.0, socially connected world. As the Summit concluded, there was a palpable sentiment that teachers couldn’t wait for the next opportunity to return next year and share their experiences using Google Apps for Education and what they’d created, and what they’d done with educational technology to improve their teaching and the learning of their students. The tools weren’t the point, the rationale for their implementation was. However, these are undeniably excellent tools in a fabulously connected online medium - Google. There were just three teachers from SD57 at the Kamloops GAFE Summit. 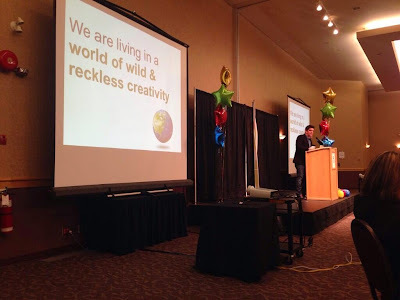 Next year, I hope to convince many more to travel to Kamloops for the proposed 2014 GAFE Summit. If you don’t wish to wait that long, here is the master schedule. I highly enjoyed the Summit and look forward to attending next year. The philosophies, reflections, training, and collaboration from this experience have already resounded in classroom opportunities for my students. Oddly enough, it feels like my students and I are just getting started.